New coupons are on Coupon.com today! 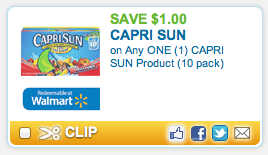 Including $1.00/ 1 Pack of Capri Sun! These are usually around $2.00 at Walmart! Good deal! You can print it twice! !